Nearly 300 years ago this month, a seamstress called Elizabeth Grant was one of 40 prisoners taken from York Prison to Liverpool, where they would sent to Antigua as indentured servants. Discover more about her life and fate in this blog entry by our volunteer, Steve Pickard. On 17 December 1745, the Jacobite Army under Charles Edward Stuart (the Young Pretender) was on its retreat back to Scotland. The Jacobite rear guard engaged Government troops under the Duke of Cumberland in a skirmish at Clifton Moor in Cumberland. Following the skirmish, the Duke’s army captured 69 Jacobite prisoners, including eight women. The Duke of Cumberland gave orders that the prisoners be held at Albany gaol in Westmorland. The eight women included two ladies and six regimental women. One of the ladies was Elizabeth Grant, a seamstress from Banff. 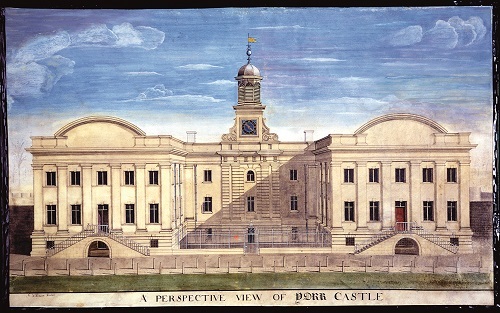 It was decided that the prisoners should be sent to York Castle. The prisoners were marched from Albany to York through the winter snows via Bowes, Richmond and Bedale, arriving in York on 31 December 1745. According to the Archbishop of York, Thomas Herring, the prisoners were in a very poor condition on arrival in York, many being bare-footed and raggedly clothed. The eight women, including Elizabeth, were held in a separate cell in the relatively newly built County Prison (Debtors’ Prison). Following her arrival at York, Elizabeth made the acquaintance of another Jacobite prisoner at the Castle, Edmund Clavering, who had been taken in a skirmish at Lowther Hall, the seat of Lord Lonsdale. Romance followed and the couple were married against prison regulations by a Catholic Priest, Father Rivat, also a prisoner in the Castle. The marriage, however, was a short one. On 8 November 1746, Edmund Clavering was one of eleven prisoners from York Castle hung at the Tyburn on York’s Knavesmire. In March 1747, the newly widowed Elizabeth together with the six regimental women captured with her were among 49 prisoners from York Castle sent to Liverpool for transportation to Antigua as indentured servants. The prisoners boarded the transport ship ‘The Veteran’ and set sail for Antigua on 8 May 1747. The voyage was uneventful until a day’s sail from Antigua when the ship was attacked by a French privateer and captured. ‘The Veteran’ and its cargo of Jacobite prisoners was taken to Martinique, where the French authorities released them. The British Government demanded their return but the French refused. The French gave the released prisoners the choice of remaining in Martinique, where they would be set up in business, or of travelling in French ships to France where they would be free to live and take up businesses. Unfortunately, there are no records as to what choice Elizabeth made, or as to her subsequent fate. Visit York Castle Museum to explore a new series of displays, ‘Powerful Women, Hidden Stories‘, telling the often unheard and forgotten experiences of women through history.